Questions over the compatibility of Islam and Human Rights have become a key area of debate in the perceived tensions between ‘Islam and the West’. In many ways, discussion over the stance of Islam in relation to such factors as gender rights, religious freedom, social and political freedoms, and other related issues represents a microcosm of the broader experience of how Muslim and ‘Western’ communities interact and relate. 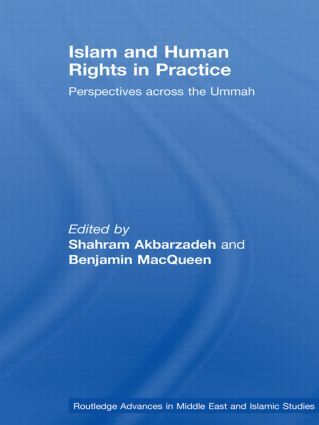 This volume seeks to engage with the various debates surrounding Islam and Human Rights, in particular, challenging assumptions of a ‘standard’ or ‘essential’ Muslim perspective on Human Rights. Through a survey of the experiences of Muslim communities across the globe (the ummah), this volume highlights the dynamic way Muslims understand and incorporate Human Rights into their personal, social and political experiences. From conceptual discussions on the issues of gender rights and religious freedom, to examining Muslim communities from South East Asia, Central Asia, the Middle East and North Africa, leading global experts bring forth key insights into the way in which Muslim communities live and experience Human Rights. The potential for deeper engagement with this issue is critical, as it opens possibilities for more profound understanding and tolerance.